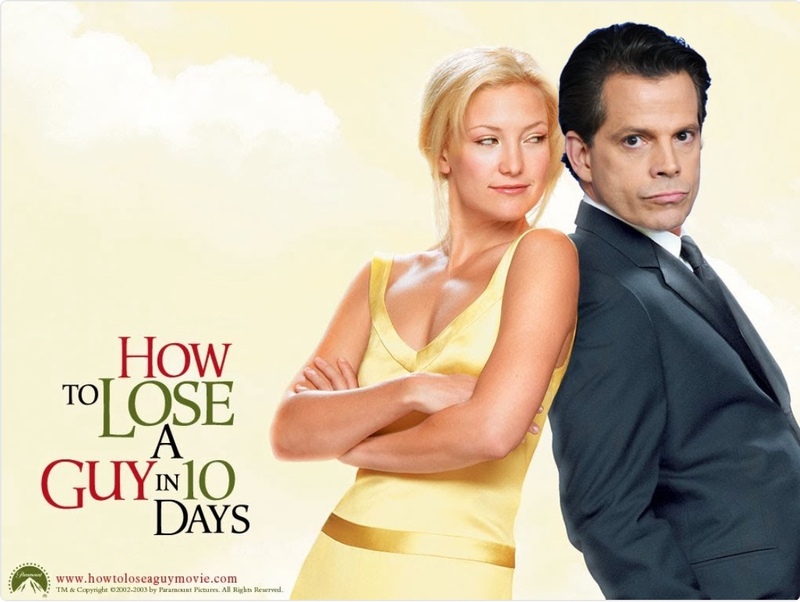 In his first day on the job, Trump chief of staff John Kelly has engineered the removal of Anthony Scaramucci from the position of communications director to which Scaramucci himself had been installed only 10 days ago. The New York Times reports here, Politico here. That sounds final to me, but the Times includes the proviso that Scaramucci might remain at the White House in another position. I think he’s outta here. In his brief tenure as communications director, Scaramucci gave the New Yorker an interview that resulted in what I believe is the most read story ever posted on the magazine’s site. It reflected no credit on President Trump and suggested to me that this was a guy who did not know how to help friends, hurt enemies or protect the White House from his own poor judgment. It also suggested to me that his communication skills might not have been all they were cracked up to be. General Kelly’s arrival at the White House cannot have come too soon. When Gen. Kelly took over as President Trump’s chief of staff, the question many asked was what this meant for Anthony Scaramucci, the new communications director. Scaramucci had taken the job with the understanding that he would report directly to Trump, bypassing Reince Priebus who was then chief of staff. It seemed extremely unlikely that Kelly would be willing to labor under such an arrangement. Now we know that he won’t have to. President Trump has removed Scaramucci as communications director. 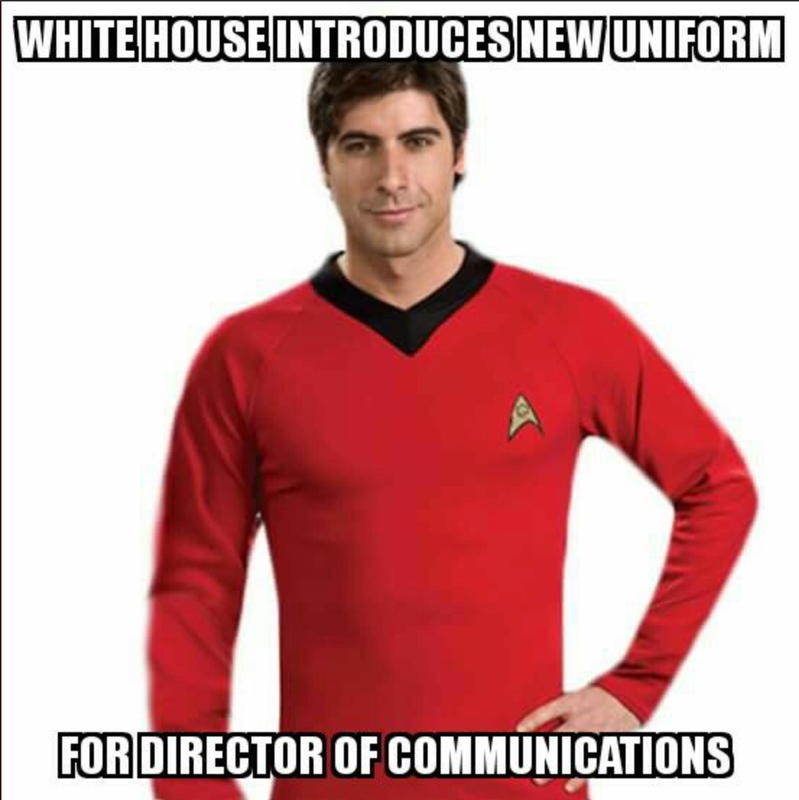 He reportedly did so at Kelly’s request. Will Scaramucci have any role in the Trump White House? According to the New York Times, it is not clear whether Mr. Scaramucci will remain employed at the White House in another position or will leave altogether. Does the firing of Scaramucci as communications director mean an end to, or substantial abatement of, White House chaos? I doubt it. But it’s a step in the right direction. 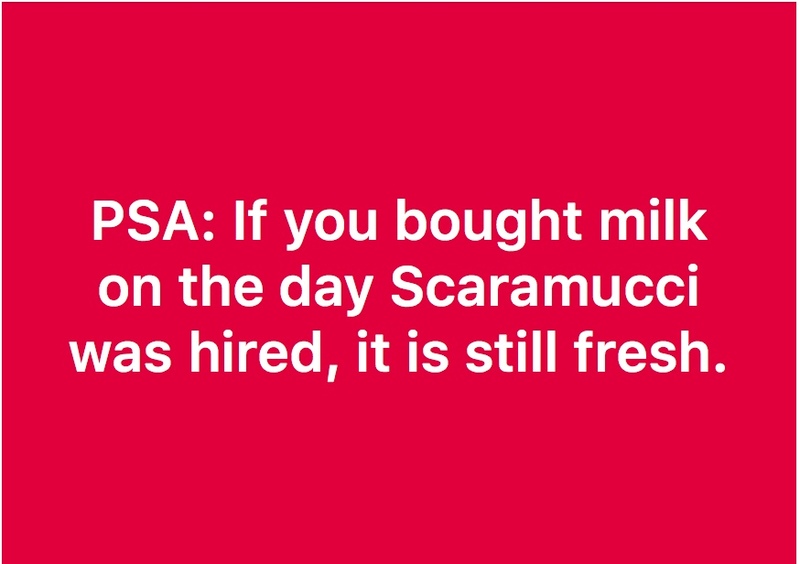 UPDATE: In his post on this subject, Steve wonders whether Scaramucci was an instrument for getting rid of Priebus. It’s a fair question. However, it would speak poorly of President Trump if he felt he needed Scaramucci in order to fire Priebus. 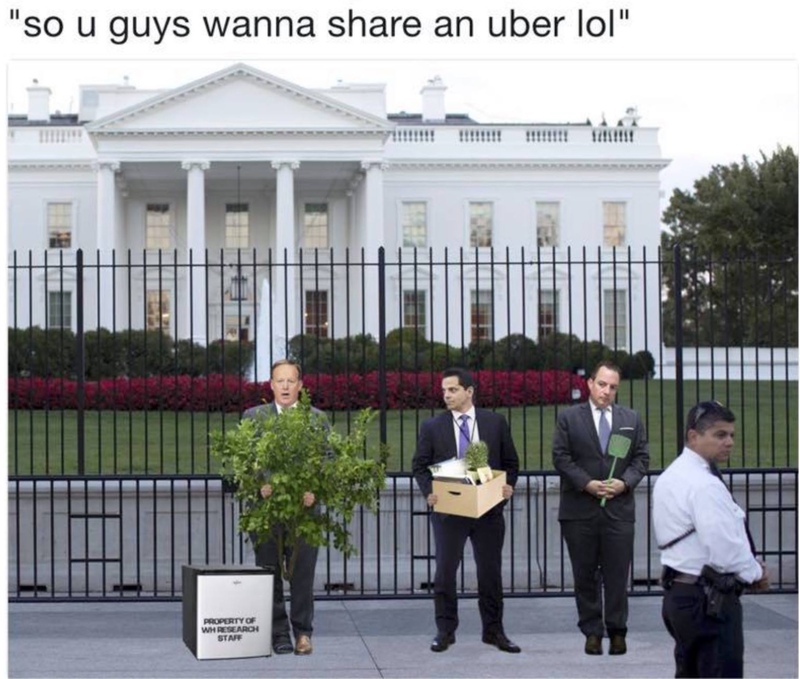 That’s something Trump should be able to do himself. 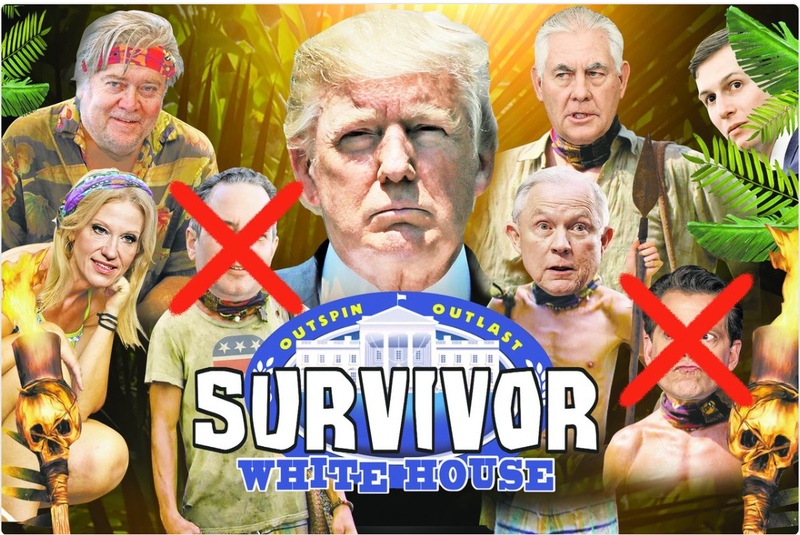 I think Trump wanted Scaramucci on the team. The New Yorker interview may (or may not) have weakened that desire. At a minimum, it must have convinced Kelly that (1) Scaramucci wouldn’t do and (2) sacking him would send an important message. I’m starting to wonder whether many of Trump’s moves are intended chiefly to excite the news media and amuse the rest of us. 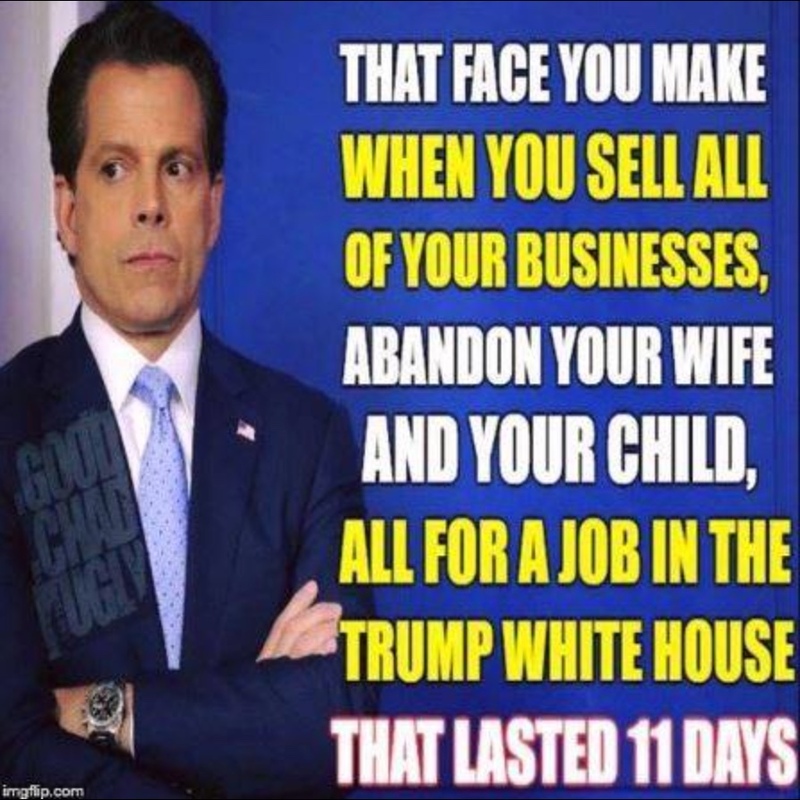 I recall seeing someone over the weekend that the over-under line on Scaramucci’s tenure was 41 days. I’m also wondering if the Mooch was an instrument for getting rid of Priebus. In any case, Kelly looks like an example of chapter 7 of The Prince. And it’s not even noon yet out here on the left coast. Hmm: seems humans can flourish in a wide range of extreme temperatures. . . Yet a prospective four-degree global average temperature rise over a century or more is supposed to be the end of mankind? What kind of wimps do they take us for? This is silliness of the first order. But let’s keep going. Let’s go back 50,000 years or so, to the beginning of the human race as we know it, when there were, by some accounts, perhaps as few as 50,000 early humans (maybe as few as 5,000 by some reckonings) mostly clustered around the Rift Valley in Africa, chiefly because the rest of the world was too cold. Like Chicago, then under about a mile of ice. Humans didn’t start to migrate around the globe in serious numbers until the last ice age ended and the place started warming up. . . But but but!!! Climate change will be radically disruptive! Twenty-foot sea level rise! More extreme storms! Droughts! Boiling frogs! Dogs and cats living together! A perfect storm of tipping points! And 45 other clichés I forgot to mention! Let’s see: More disruptive than the black plague of the 14th century (one-third of Europe killed)? More disruptive than the Hundred-Years War or the Thirty-Years War? More disruptive than World War I and World War II? More disruptive than Nazism and Communism? We survived all of these, and moreover human progress continued. And climate change pales before prospective or active disruptions right in front of us. More disruptive than what’s presently disrupting the Middle East? More disruptive than a President Trump? More disruptive than a prospective nuclear war between India and Pakistan (which has almost happened once)? I guarantee that if there’s a major nuclear war in our future, UN climate conferences won’t be very well attended, because no one will care about greenhouse gas emissions. This is the preface to bringing your attention to the splendid article in today’s Wall Street Journal from David R. Henderson and John H. Cochrane, “Climate Change Isn’t the End of the World.” (Access it through Google here if you’re not a Journal subscriber.) I am quite ready to declare this to be the best article on climate change for 2017, even though we have five more months to go. Migration is costly. But much of the world’s population moved from farms to cities in the 20th century. Allowing people to move to better climates in the 21st will be equally possible. Such investments in climate adaptation are small compared with the investments we will regularly make in houses, businesses, infrastructure and education. And economics is the central question—unlike with other environmental problems such as chemical pollution. Carbon dioxide hurts nobody’s health. It’s good for plants. Climate change need not endanger anyone. If it did—and you do hear such claims—then living in hot Arizona rather than cool Maine, or living with Louisiana’s frequent floods, would be considered a health catastrophe today. Global warming is not the only risk our society faces. Even if science tells us that climate change is real and man-made, it does not tell us, as President Obama asserted, that climate change is the greatest threat to humanity. Really? Greater than nuclear explosions, a world war, global pandemics, crop failures and civil chaos? No. Healthy societies do not fall apart over slow, widely predicted, relatively small economic adjustments of the sort painted by climate analysis. Societies do fall apart from war, disease or chaos. Climate policy must compete with other long-term threats for always-scarce resources. Do read the whole thing, and share it widely. And then sit back and watch the fireworks as the climatistas lose their minds over this heresy. I can’t wait to see the outraged letters that pour into the Journal over this. Climate change is often misunderstood as a package deal: If global warming is “real,” both sides of the debate seem to assume, the climate lobby’s policy agenda follows inexorably. It does not. Climate policy advocates need to do a much better job of quantitatively analyzing economic costs and the actual, rather than symbolic, benefits of their policies. Skeptics would also do well to focus more attention on economic and policy analysis. To arrive at a wise policy response, we first need to consider how much economic damage climate change will do. Current models struggle to come up with economic costs commensurate with apocalyptic political rhetoric. Typical costs are well below 10% of gross domestic product in the year 2100 and beyond. That’s a lot of money—but it’s a lot of years, too. Even 10% less GDP in 100 years corresponds to 0.1 percentage point less annual GDP growth. Climate change, therefore, does not justify policies that cost more than 0.1 percentage point of growth. If the goal is 10% more GDP in 100 years, pro-growth tax, regulatory and entitlement reforms would be far more effective. Yes, the costs are not evenly spread. Some places will do better and some will do worse. The American South might be a worse place to grow wheat; Southern Canada might be a better one. In a century, Miami might find itself in approximately the same situation as the Dutch city of Rotterdam today. But spread over a century, the costs of moving and adapting are not as imposing as they seem. Rotterdam’s dikes are expensive, but not prohibitively so. Most buildings are rebuilt about every 50 years. If we simply stopped building in flood-prone areas and started building on higher ground, even the costs of moving cities would be bearable. Migration is costly. But much of the world’s population moved from farms to cities in the 20th century. Allowing people to move to better climates in the 21st will be equally possible. Such investments in climate adaptation are small compared with the investments we will regularly make in houses, businesses, infrastructure, and education. No. Healthy societies do not fall apart over slow, widely predicted, relatively small economic adjustments of the sort painted by climate analysis. Societies do fall apart from war, disease or chaos. Climate policy must compete with other long-term threats to always-scarce resources. Appeared in the July 31, 2017, print edition.